Please note: at the time this sheet was written, the genus name for this species was commonly considered to be Mesotriton. It is now Ichthyosaura. 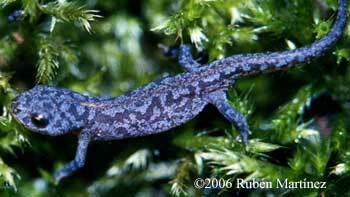 The alpine newt normally measures 8-12 cm (3-4.5 in), although some individuals from populations found at very high altitudes grow larger. The male is usually slightly smaller and thinner than the female. Males, especially in the breeding season, show a low crest with black and yellow bars going from the back of the head to the tip of the tail and a whitish-yellow band with black spots on each flank. The dorsal colour is greyish-blue in males, brownish-beige in females. 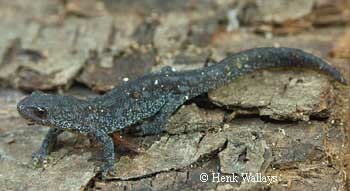 However the color can vary depending on the substrate or the mood and health of the newt. 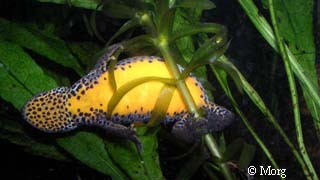 The belly is usually orange or red without any spots, but can be yellow, depending on diet. 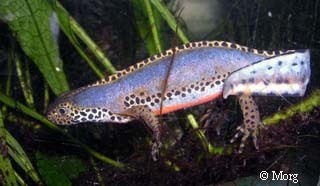 On land these newts have a darker colour and a more velvety skin. The larvae measure 7-8 mm (4/16 - 5/16 in) when just hatched and can grow to 4-5 cm (1.5-2 in) before metamorphosis. Neoteny is frequent. 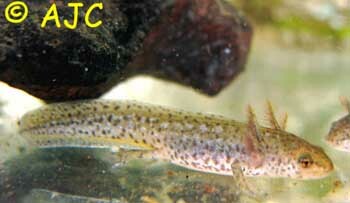 There are several subspecies of Mesotriton alpestris. The alpestris, apuanus and cyreni subspecies are the most commonly kept and bred in captivity. These 3 subspecies require very similar conditions, although alpestris and cyreni seem to be more terrestrial than apuanus, especially newly metamorphosed individuals. M. a. alpestris: The nominate form found in northern France, Germany, Belgium, Netherlands, Luxemburg, Poland, Austria, Switzerland, Hungary, Czech republic, and the Balkan peninsula. M. a. apuanus: Found in northern Italy below the Alps and on the Appennine Mountains. Almost the same in appearance as M. a. alpestris except for having a spotted throat. M. a. apuanus female laying eggs. 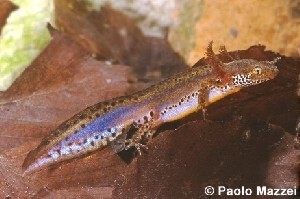 M. a. cyreni: Relict population found in the Cantabrian Mountains. It is very similar to alpestris and apuanus, but with a larger head and a rounded body. M. a. veluchiensis: From central Greece. Characterized by a short tail. M. a. reiseri: From Prokosko lake in Bosnia. A very large and robust subspecies, frequently neotenic. M. a. lacusnigri: Found in Slovenia. Similar to reiseri, but with a wider head. M. a. montenegrinus: Totally neotenic subspecies from Montenegro. M. a. sedardus: Another neotenic subspecies from Zminicko in Montenegro. M. a. piperianus: Found at Kapetanovo and Manito lakes in Montenegro. M. a. inexpectatus: Found in southern Italy (Calabria). Similar to apuanus. Male M. a. apuanus neotine. Female M. a. apuanus neotine. Food for the adults can consist of maggots, earthworms, strips of raw lean meat (removed immediately if not eaten) and anything else that can enter their mouths. Juveniles and larvae can be fed Artemia (brine shrimp), tubifex, chyronomid larvae (bloodworms), daphnia, cyclops and Enchytraeus (white worms). Keep in mind that the redder the food color, the redder the bellies will be. If you feed the young only white worms, the color of their bellies will be pale yellow. If kept outdoors, a vivarium can be made by building a 1-m high square wall and covering the structure with netting to avoid predators that kill newts (from rats to dragonflies). The bottom will have to be covered with netting as well for the same reasons. It needs to be built in a shady area of your garden, and plenty of food needs to be added regularly. Hiding places can be made by making piles of stones and decaying wood. M. alpestris is a very aquatic species; this means the water part needs to be quite large. Note: outdoor housing is possible only in mild climates. If kept indoors, alpines can be kept in either a semi-aquatic or completely aquatic set up. I keep mine in the latter because they are easier to feed while in water. If you don't use a filter, you must have a lot of plants to oxygenate the water and to absorb waste products. The aquatic part of the tank should have some plants for egg laying, stones as hiding places, and, if you want to give the tank a better look, some fine gravel as a substrate. Water depth should be at least 20 cm (8 in). Alpines are found in still or slowly flowing water, so don't use too powerful a filter, otherwise you'll agitate them like a washing machine! The terrestrial part of the tank should have fine gravel as a substrate. I would avoid soil because if you don't have lots of plants in it, with time, it might become a good vehicle for bacterial diseases. Make lots of hiding places. Mosses and ferns are suitable as plants. Be careful! Newts can easily climb glass. REMEMBER: temperature should never be allowed to go above 23°C (73°F). In fact, alpines prefer temperatures in the range of 10-18°C (50-65°F). Don't place the tank in direct sunlight. No particular lighting is required by the newts, but if you have plants then you'll need a special bulb for them. Put the animals for 2-3 months in a refrigerator with a constant temperature of 2-4°C (36-39°F). The animals will usually not need to eat at this temperature. Move the enclosure outside during the winter months. Take care that they cannot freeze. A shed, garage, or greenhouse may be useful. The animals may need to eat, depending on their temperature and activity level. Use a chiller or basement to reduce the temperature. Depending on the subspecies involved, reduction to 14-17°C (58-64°F) may be sufficient to induce breeding. At this temperature, the animals will certainly continue to eat. 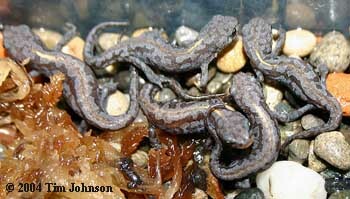 If your newts have had a proper cooling period, you may breed them successfully. 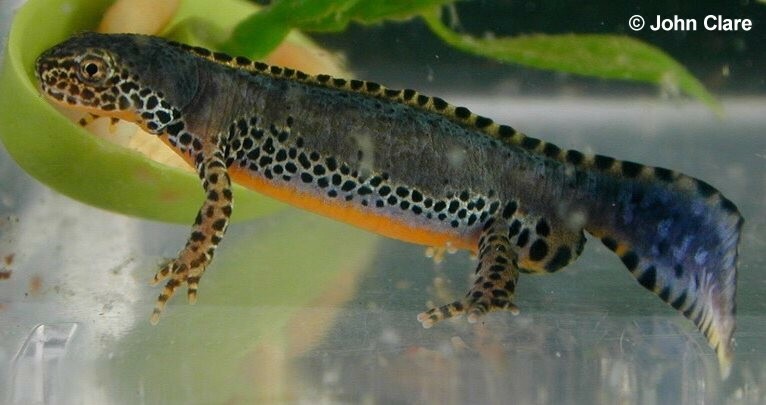 Place the newts in an aquarium with plenty of plants to lay their eggs on. The male will develop a swollen cloaca and a dorsal crest. During courtship, the male will fan his tail towards the female. He will then produce a spermatophore taken by the female in her cloaca to fertilize the eggs. 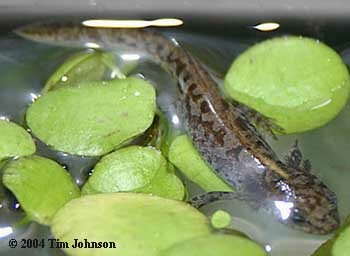 A plump female may lay up to 200 eggs, wrapping them in aquatic plant leaves. Remove the eggs to avoid the parents eating them and rear them in a separate container. Low temperatures make hatching slower. For the first few days after the eggs hatch, the larvae will feed on their yolk sack. You can then start giving them freshly-hatched brine shrimp, etc. Larvae will take 4-6 months to metamorphose depending on the temperature. 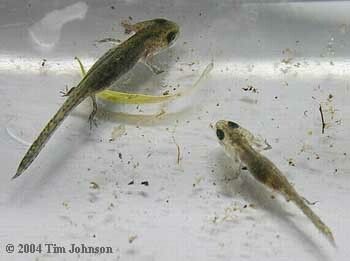 Newly metamorphosed apuanus can be kept in water while cyreni and alpestris seem more terrestrial. 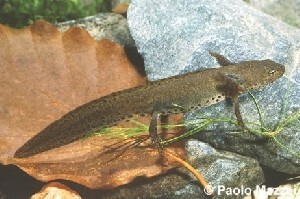 Alpine newts reach sexual maturity in approximately 1 to 3 years. Ambrogio Andrea, Gilli luca (1998) Il tritone alpestre. Edizioni Planorbis. Arnold E. N. Burton J. A. (1992) Reptiles & Amphibians of Britain & Europe. Collins. Gattelli Raffaele (2001) L'invisibile popolo del fango-Gli anfibi italiani. Calderini Edagricole. Mattison Chris (1993) Keeping and breeding amphibians. Blandford. Thorn Robert (1968) Les salamandres. Editions Paul Lechevalier. © 2003 Francesco Spallone. Posted May 2003. Minor revisions by Jennifer Macke, January 2006.